Exercise-induced pulmonary hemorrhage, mild anabolic steroid. Estrone is a naturally occurring form of estrogen. In the horse, it is produced by the ovaries, placenta, and testis. Estradiol is the dominant estrogen in mares and is responsible for sexual behavior. There is very little scientific study of exogenous estrone use, but this drug has been used for many years based on anecdotal information and general knowledge regarding the basic properties of estrogens. Exogenous estrone is administered to performance horses, particularly geldings, as a possible preventive for exercise-induced pulmonary hemorrhage (EIPH) and for its mild anabolic-effects. Stress failure of pulmonary capillaries is one hypothesized component in the pathogenesis of EIPH. The rationale for estrone use in these circumstances is that estrogens may reduce capillary bleeding and accelerate clot formation. 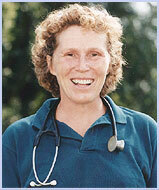 Unfortunately estrone and other estrogens have not been effective to treat this major health-problem of racehorses. There are veterinarians who use estrone on a regular basis for its mild anabolic properties. Although estrogens are only mildly anabolic, they do not have the adverse behavioral side-effects sometimes seen with other anabolic steroids. In fact, estrogens are thought to be mood-enhancing in most species, causing some horse owners to attribute improvements in attitude, weight gain, and way of going to estrogen/estrone supplementation. No side effects have been reported when estrone is used with performance horses. Estrogens should not be used in the pregnant mare. The effects of glucocorticoids may be enhanced when used with estrogens. The dose of corticosteroids may need to be reduced. No information regarding acute overdose or toxicity was found in the literature.